“Fort Wayne” redirects here. For other uses, see Fort Wayne (disambiguation). Nickname(s): "The Summit City" (official), "The City of Churches", "The City That Saved Itself", "Magnet Wire Capital of the World"
Fort Wayne is a city in the U.S. state of Indiana and the county seat of Allen County. The population was 254,555 as of the 2012 Census estimate making it the 74th largest city in the United States and the second largest in Indiana after Indianapolis. The municipality is located in northeastern Indiana, approximately 18 miles (29 km) west of the Ohio border and 50 miles (80 km) south of the Michigan border. Fort Wayne is the principal city of the Fort Wayne metropolitan area, consisting of Allen, Wells, and Whitley counties, for an estimated population of 419,453. In addition to those three core counties, the combined statistical area includes Adams, DeKalb, Huntington, Noble, and Steuben counties, for a population of about 615,077. Under the direction of American Revolutionary War statesman Anthony Wayne, the United States Army built Fort Wayne last in a series of forts near the Miami tribe village of Kekionga in 1794. Named in Wayne's honor, the settlement established itself at the confluence of the St. Joseph River, St. Marys River, and Maumee River as a trading post for European pioneers. The village was platted in 1823 and experienced tremendous growth after completion of the Wabash and Erie Canal and advent of the railroad. Once a booming industrial town located in the Rust Belt, Fort Wayne's economy has diversified in recent times, now relying on distribution, transportation, and logistics, health care, manufacturing, professional and business services, leisure and hospitality, and financial services. The city is also a center for the defense contractor industry which employs thousands in the city. As northeastern Indiana's cultural hub, Fort Wayne is home to 15 museums and art galleries, two daily newspapers, philharmonic orchestra, botanical conservatory, zoo, three minor league sports franchises and an NCAA Division I member school, and 86 public parks. The city is home to the fifth-largest public university in Indiana, Indiana University–Purdue University Fort Wayne (IPFW), and the private universities of Concordia Theological Seminary, Indiana Institute of Technology, and University of Saint Francis. The city is also recognized as the final resting place of American folklore legend Johnny Appleseed. The city has been an All-America City Award recipient in 1982, 1998, and 2009. The Miami people first established a settlement at the Maumee, St. Joseph, and St. Marys rivers in the mid-17th century called Kekionga, capital of the Miami nation and related Algonquian tribes. In the 1680s, the first Europeans in the area (French traders) established a post near Kekionga because of its location on a portage between the Great Lakes and Mississippi River. In 1696, Comte de Frontenac appointed Jean Baptiste Bissot, Sieur de Vincennes, as commander of this French outpost. The French built the first fort on the site, Fort Miami, in 1697 as part of a group of forts built between Quebec, Canada, and St. Louis. In 1721, a few years after Bissot's death, Fort Miami was replaced by Fort St. Philippe des Miamis. The first census, performed in 1744 on the order by the governor of Louisiana, revealed a population of approximately 40 Frenchmen and 1,000 Miami. Increasing tension between France and the United Kingdom developed over the territory, and in 1760, the area was ceded to the British Empire after French forces surrendered during the French and Indian War. In 1763, various Native American nations rebelled against British rule and retook the fort as part of Pontiac's Rebellion. The Miami regained control of Kekionga, a rule that lasted for more than 30 years. In 1790, President George Washington ordered the United States Army to secure Indiana. 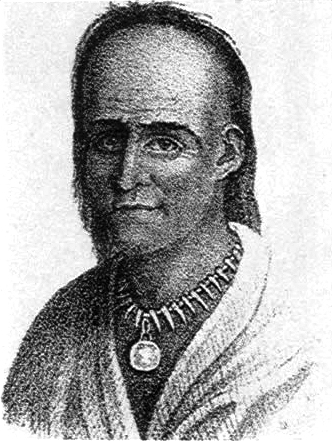 Three battles were fought at Kekionga against Little Turtle and the Miami Confederacy. Miami warriors defeated the U.S. forces in the first two battles. Anthony Wayne led a third expedition resulting in the destruction of Kekionga and the start of peace negotiations between Little Turtle and the U.S. After General Wayne refusal to negotiate, the tribe was advanced to Fallen Timbers where they were defeated on August 20, 1794. On October 22, 1794, U.S. forces captured the Wabash–Erie portage from the Miami Confederacy and built a new fort at the three rivers, Fort Wayne, in honor of the general. In 1819, three years after Indiana's statehood, the military garrison was discontinued and a federal land office opened to sell land ceded by local Native Americans by the Treaty of St. Mary's. Platted in 1823, the village became an important frontier outpost, and was incorporated as the Town of Fort Wayne in 1829, with a population of 300. The arrival of the Wabash and Erie Canal eased travel to the Great Lakes and Mississippi River, opening Fort Wayne to expanded economic opportunities. The population topped 2,000 when the town was incorporated as the City of Fort Wayne on February 22, 1840. Fort Wayne's nickname as "The Summit City" came from its position at the highest elevation along the canal's route. As influential as the Wabash and Erie Canal was to the city's earliest development, it quickly became obsolete after briefly competing with the city's first railroad, the Pittsburgh, Fort Wayne and Chicago Railway, completed in 1854. A lithograph of Fort Wayne in 1868. At the turn of the 20th century, the city's population had reached nearly 50,000, attributed to a large influx of German and Irish immigrants. Fort Wayne's "urban working class" thrived in industrial and railroad-related jobs. Fort Wayne's economy was based substantially on manufacturing which ushered in an era of innovation with several notable inventions coming out of the city over the years; baking powder, gasoline pumps, the country's first municipal lighting system, first high fidelity phonograph, refrigerator, breathalyzer, garbage disposal, transistor radio, jukebox, calculator, and in 1972, the first home video game console, were developed in Fort Wayne. In 1913, the three rivers flooded, causing seven deaths, leaving 15,000 homeless, and damaging over 5,500 buildings in the worst natural disaster in the city's history. As the automobile's prevalence grew, Fort Wayne became a fixture on the Lincoln Highway, the country's first coast-to-coast highway. Aviation arrived in 1919 with the opening of the city's first airport, Smith Field. The airport served as Fort Wayne's primary commercial airfield until Fort Wayne International Airport was transferred to the city in 1947 after use as a military base during World War II. Fort Wayne was hit by the Great Depression beginning in 1929, with most factories cutting their workforce. The stock market crash did not discourage plans to build the city's first skyscraper and Indiana's tallest building at the time, the Lincoln Bank Tower. By 1935, the New Deal's WPA put over 7,000 residents back to work through local infrastructure improvements, including the construction of new parks, bridges, viaducts, and a $5.2 million sewage treatment facility. The post-World War II economic boom helped the city prosper once again, but began a slow trend shifting business from downtown to the suburbs. Between 1950 and 1955, more than 5,000 homes were built, many in large subdivisions in rural Allen County. Suburban strip malls followed, with the city's first, Anthony Wayne Village, opening in 1947. In 1950, Fort Wayne's first bypass (Coliseum Boulevard) opened on the north side of the city, followed by the city's first arena (War Memorial Coliseum), bringing new opportunities for suburban expansion. The Coliseum was home to the NBA's Fort Wayne Pistons from 1952 to 1957. Fort Wayne's first enclosed shopping malls, Glenbrook Square (1966) and Southtown Mall (1969), along with the completion of I-69 in rural areas north and west of the city proper, further drove the exodus of retail from downtown through the 1960s. According to Fort Wayne Home Builders Association estimates, more than 80 percent of new home construction occurred outside the city proper in the 1970s. Superior Street during flooding in 1982. Like many cities in the Rust Belt, the 1980s brought urban blight, increased crime, and a decrease in blue-collar manufacturing jobs. Downtown and its surrounding neighborhoods continued declining as more residents and businesses sprawled further into rural Allen County. A 1982 flood forced 9,000 residents to evacuate, damaging 2,000 buildings, costing $56.1 million, and prompting a visit from President Ronald Reagan. The 1990s marked a turnaround for the area, as officials focused on crime reduction, economic diversification, and downtown redevelopment. By 1999, Fort Wayne's crime rate decreased to levels not seen since 1974, and the city's economy recovered, with the unemployment rate hovering at 2.4 percent in 1998. Clearing blighted buildings downtown was a focus, with the openings of a plaza at One Summit Square (1991), the Courthouse Green (1999), and Headwaters Park, built at a cost of $16.9 million between 1995 and 1999. Headwaters has since become the premier community gathering space and centerpiece in the city's $50 million flood control project. Fort Wayne celebrated its bicentennial in 1994. Fort Wayne continued concentrating on downtown redevelopment and investment in the 2000s. The decade saw the beginnings of a transformation, with the renovations and expansions of the Main Library Branch, Grand Wayne Convention Center, and Fort Wayne Museum of Art. In 2007, the $130 million Harrison Square development was launched, which included a new baseball stadium, parking garage, apartments, retail, and hotel. Parkview Field opened in 2009 and Courtyard by Marriott in 2010. In 2011, the underused Anthony Wayne Building began its conversion into 50 condominiums and retail space, costing $15 million. Suburban growth continued, with the opening of Fort Wayne's first lifestyle center, Jefferson Pointe, in 2001 and the $536 million Parkview Regional Medical Center in 2012. A flood wall lines the St. Joseph River in northern Fort Wayne. Fort Wayne is located in the East North Central region of the Midwestern United States, in northeastern Indiana, about 18 miles (29 km) west of Ohio and 50 miles (80 km) south of Michigan. According to the 2010 census, the city has a total area of 110.83 square miles (287.0 km2), of which 110.62 square miles (286.5 km2) (or 99.81%) is land and 0.21 square miles (0.54 km2) (or 0.19%) is water. For a regional summit, Fort Wayne lies on fairly flat land with indistinct hills and valleys, the result of the Wisconsin glaciation episode. Receding glaciers eroded the land, depositing an evenly distributed layer of sediment during the Ice Age. Perhaps the most distinguishable topographical feature is Cedar Creek Canyon, just north of the city proper near Huntertown. West of the city lies the Tipton Till Plain, while land east of the plain is the former Black Swamp. The St. Marys River, flowing northward, and the St. Joseph River, flowing southward, converge roughly in the center of the county to form the Maumee River, which flows northeastward, eventually emptying into Lake Erie. The city lies along the St. Lawrence Continental Divide which separates the Great Lakes Basin from the Gulf of Mexico watershed. Fort Wayne lies in the humid continental climate zone (Köppen climate classification: Dfa), experiencing four distinct seasons. Typically, summers are hot and humid and winters are generally cold with moderate snowfall. The average annual precipitation is 37.9 in (960 mm), recorded at Fort Wayne International Airport. During the winter season, snowfall accumulation averages 32.9 in (84 cm) per year. Lake-effect snow is not uncommon to the region, but usually appears in the form of light snow flurries. The National Weather Service reports the highest recorded temperature in the city at 106 °F (41 °C), most recently on June 28, 2012, and the lowest recorded temperature at −24 °F (−31.1 °C) on January 12, 1918. The wettest month on record was July 1986, with 11.00 inches (279 mm) of precipitation. The greatest 24-hour rainfall was 4.93 in (125 mm) on August 1, 1926. The snowiest month on record was 29.5 in (75 cm) in January 1982. The greatest 24-hour snowfall was 13.6 in (35 cm) on March 10, 1964. Severe weather is not uncommon, particularly in the spring and summer months; the city experiences an average of 39 thunderstorm days and about 10 severe weather days annually. An EF2 tornado struck northern Fort Wayne on May 26, 2001, injuring three and causing damage along the Coliseum Boulevard corridor and a subdivision. Fort Wayne experienced 91 mph wind gusts in the June 2012 North American derecho, knocking out power to 78,000, uprooting approximately 500 trees, and costing $2.5 million. Homes in the Williams-Woodland Park Historic District. Historically, Fort Wayne has been divided into four unofficial quadrants: northeast, northwest, southeast, and southwest. Calhoun Street serves as the dividing line between the southwest and southeast, while the Saint Joseph River divides the northwest and northeast quadrants. The Maumee River separates the northeast and southeast, while portions of the Saint Marys River and Chicago, Fort Wayne and Eastern Railroad separate the northwest and southwest quadrants. Rotunda of the Allen County Courthouse. The building became a National Historic Landmark in 2003. 19th century Fort Wayne was dominated by Greek Revival, Gothic Revival, and Italianate architecture. Few examples of Greek Revival architecture remain in the city, with one being the Richardville House (1827), a National Historic Landmark. Gothic and Gothic Revival architecture can be found in some of the city's most prominent churches, including the Cathedral of the Immaculate Conception (1860), Trinity Episcopal Church (1865), and Saint Paul's Evangelical Lutheran Church (1889). Popular early-20th-century architectural styles found in the city include Queen Anne, Richardsonian Romanesque, Neoclassical, Colonial Revival, Dutch Colonial Revival, Tudor Revival, Prairie, American Craftsman, American Foursquare, and Art Deco. Richardsonian Romanesque buildings include Fort Wayne City Hall (1893), Engine House No. 3 (1893), and John H. Bass Mansion (1902), each designed by Wing & Mahurin. Notable examples of Neoclassical architecture include the Masonic Temple (1926) and North Side High School (1927). Beaux-Arts, an architectural style closely related to Neoclassical, gained popularity during the City Beautiful movement of the 1890s and early 1900s, which is reflected in the Allen County Courthouse (1902). The Allen County Courthouse is one of two National Historic Landmarks in the city. The Pennsylvania Railroad Station, also known as Baker Street Station (1914), was designed in American Craftsman style. Art Deco buildings in the city include Fort Wayne's first highrise and Indiana's tallest building (1930–1962) the 312 feet (95 m) Lincoln Bank Tower and the E. Ross Adair Federal Building and United States Courthouse (1932). Williams-Woodland Park Historic District includes examples of Queen Anne and Colonial Revival residential homes, while the Forest Park Boulevard Historic District includes Tudor Revival homes. Modern and Postmodern architecture can be found in buildings constructed during the second half of the 20th century in Fort Wayne. The John D. Haynes House (1952) was designed by Frank Lloyd Wright, while the campus of Concordia Theological Seminary (1953) was designed by Eero Saarinen. Postmodern architect Michael Graves' first commissions were built in the city, including Hanselmann House (1967) and Snyderman House (1972, now demolished). Louis Kahn's design for the Arts United Center (1973) was inspired by a violin and its case. Other notable buildings include One Summit Square (1982), the tallest building in the city and tallest building in Indiana outside of Indianapolis, at 442 feet (135 m). The first census was performed in 1744 on the order by the governor of Louisiana, revealed a population of approximately forty Frenchmen and one thousand Miami. Fort Wayne is cited as having the highest Burmese American population in the United States, with estimates near 6,000. According to the 2010 Census, there were 253,691 people and 113,541 households. The racial makeup of the city is 73.62% White, 15.41% Black or African American, 0.37% Native American, 3.3% Asian (1.4% Burmese, 0.4% Indian, 0.3% Vietnamese, 0.2% Chinese, 0.2% Filipino, 0.1% Korean, 0.1% Laotian, 0.1% Thai), 0.06% Pacific Islander, 3.72% from other races, and 3.52% from two or more races. 7.96% of the population are Hispanic or Latino of any race. Among the Hispanic population, 6.1% are Mexican, 0.4% Puerto Rican, and 0.3% Guatemalan. Non-Hispanic Whites were 70.3% of the population in 2010, down from 87.7% in 1970. According to the census of 2000, there were 90,915 housing units at an average density of 1,151.5 per square mile (444.6/km²). There were 83,333 households out of which 31.5% had children under the age of 18 living with them, 41.9% were married couples living together, 14.6% had a female householder with no husband present, and 39.2% were non-families. 32.6% of all households were made up of individuals and 10.3% had someone living alone who was 65 years of age or older. The average household size was 2.41 and the average family size was 3.08. In the city the population is spread out with 27.0% under the age of 18, 10.7% from 18 to 24, 30.2% from 25 to 44, 19.7% from 45 to 64, and 12.5% who are 65 years of age or older. The median age is 33 years of age. For every 100 females there are 94.0 males. For every 100 females age 18 and over, there are 90.4 males. The Cathedral of the Immaculate Conception. Fort Wayne is sometimes referred to as the "City of Churches," an unofficial moniker dating to the late-19th century when the city was the regional hub of Catholic, Lutheran, and Episcopal faiths. Today, there are approximately 360 churches in the city. 54 percent of Fort Wayne residents identify as religious, slightly above the national average of 49 percent. 16 percent are Catholic, 9 percent are Lutheran, 6.5 percent are Baptist, 5 percent are Methodist, and 0.14 percent are Jewish, with 16.5 percent adhering to other Christian faiths. An increasing religious minority is found among the city's immigrant communities, including Buddhism, Hinduism, and Islam. On the site of today's Cathedral of the Immaculate Conception, St. Mary's opened as the city's first Catholic parish between 1834 and 1835. Saint Paul's Evangelical Lutheran Church was founded in 1837 as Fort Wayne's first Lutheran church and second Lutheran congregation in Indiana. Trinity Episcopal Church opened in 1850 as the first permanent Episcopal church in the city. Fort Wayne's Reform Judaism population is served by Congregation Achduth Vesholom, the oldest Jewish congregation in Indiana, founded in 1848. Congregation B'nai Jacob serves the area's Conservative Jewish population. Both congregations are members of the Fort Wayne Jewish Federation. In 2013, construction began on the first Burmese Muslim mosque to be built worldwide since the mid-1970s. Burmese people have immigrated to the United States in part to escape religious persecution in Myanmar, where more than 30 mosques have been destroyed. As of December 2012, four national Christian denominations were headquartered in the city: the American Association of Lutheran Churches, Fundamental Baptist Fellowship Association, Missionary Church, Inc., and Fellowship of Evangelical Churches. Fort Wayne is the seat of the Roman Catholic Diocese of Fort Wayne-South Bend (covering 14 counties in Northern Indiana) and the Lutheran Church–Missouri Synod's Indiana District (encompassing all of Indiana and north central Kentucky). Manufacturing is deeply rooted in Fort Wayne's economic history, dating to the earliest days of the city's growth as an important trade stop along the Wabash and Erie Canal. Railroads, introduced shortly after the canal's arrival, strengthened and eased travel from Fort Wayne to other booming industrial centers along the Great Lakes, such as Chicago, Detroit, Toledo, and Cleveland. Throughout the early and mid-20th century, manufacturing dominated the city's economic landscape. From 1900 to 1930, Fort Wayne's industrial output expanded by 747 percent, with total production valued at $95 million in 1929, up from $11 million in 1899. The total workforce also increased from 18,000 in 1900 to nearly 50,000 in 1930. Firms with locations in the city included Dana Corporation, Falstaff Brewing Corporation, Fruehauf Corporation, General Electric, International Harvester, Magnavox, Old Crown Brewing Corporation, and Tokheim, among several others, producing such items as refrigerators, washing machines, automatic phonographs, meat-packing products, televisions, garbage disposals, automotive parts and motors, trailers, gasoline pumps, trucks, beer, tents and awnings. Magnet wire production became an especially vital component to the city's economy. In 1960, Fort Wayne was at the center of the United States magnet wire industry, home to New Haven Wire and Cable Company, Phelps Dodge, Rea Magnet Wire, Superior Essex, and an operation at Fort Wayne's General Electric plant, producing nearly 90 percent of North America's magnet wire. The 1970s and 1980s were times of economic depression in Fort Wayne. As much of the city's manufacturing foundation eroded and the blue-collar workforce shrank, Fort Wayne joined several other cities reeling economically within the Rust Belt. The biggest blow to the city's economy came September 27, 1982 when International Harvester announced it would close its Fort Wayne assembly plant, which had employed 10,600 at its peak. Amid other area plant closures, coupled with the early 1980s recession, the city lost 30,000 jobs and had reached a 12.1 percent unemployment rate. General Motors' arrival to Allen County in 1987 helped fill the void left by International Harvester and aided in the area's recovery, employing 3,000 at its Fort Wayne Assembly. Through the 1990s and into the 2000s, the city diversified its economy; manufacturing now employs 16.9 percent of Allen County's workforce. Other important sectors include distribution, transportation, and logistics (23.1 percent), health care (17.9 percent), professional and business services (12.1 percent), leisure and hospitality (11.1 percent), and financial services (6.3 percent). The leisure and hospitality sector has especially grown, with 5.7 million visitors spending more than $466 million in Fort Wayne in 2009. The city is also a center for the defense industry, employing thousands at such companies as BAE Systems (1,150), ITT Exelis (1,165), Raytheon Systems (950), and the Fort Wayne Air National Guard Station (423). In 2012, the county's workforce was 174,207 with an unemployment rate of 8.3 percent. Fort Wayne serves as headquarters for such companies as Do it Best, Franklin Electric, Frontier Communications – Central Region, Genteq, Indiana Michigan Power, K&K Insurance, Medical Protective, North American Van Lines, Rea Magnet Wire, Steel Dynamics, Sweetwater Sound, and Vera Bradley. Steel Dynamics is the only Fortune 500 company headquartered in the city, ranking 318th. Founded in 1905 in the city, Lincoln National Corp. employs nearly 2,000 at the former corporate headquarters downtown. Marquee of the historic Embassy Theatre in downtown. The Embassy Theatre is a 2,471-seat performing arts theater originally built in 1928 as a movie palace. The Embassy presents shows ranging from concert tours, Broadway musicals, dance, community events, and lectures, serving over 200,000 patrons annually. The Embassy has often hosted the Fort Wayne Philharmonic Orchestra, since its founding in 1944. Indiana University–Purdue University Fort Wayne's College of Visual and Performing Arts includes the 85,000-square-foot (7,900 m2), 1,600 seat John and Ruth Rhinehart Music Center (opened in 2007) and the 297 seat Ernest E. Williams Theatre (opened in 1992). The University of Saint Francis Performing Arts Center, located on its Downtown Campus, contains a 2,086-seat auditorium. Since its establishment in 2010, the downtown Cultural District has included the Arts United Center, Auer Center for Arts and Culture, the Fort Wayne Museum of Art, and Hall Community Arts Center. Arts United Center houses the Fort Wayne Civic Theater, Fort Wayne Dance Collective, and Fort Wayne Youtheatre, with seating for 660. Auer Center for Arts and Culture (opened in 2011) houses Fort Wayne Ballet among other cultural organizations; a black box theater with seating for 200 is under construction as of October 2013. Hall Community Arts Center anchors the east side of the district, housing Cinema Center. Though used mainly for exhibitions and conventions, the Grand Wayne Convention Center hosts dance and choir productions, such as the annual Foundation for Art and Music in Education (FAME) Northeast Festival. FAME annually showcases about 17,000 local arts and musical participants. Since 1987, FAME has reached 3.2 million through multicultural and arts programs in 40 northern Indiana counties. The open-air Foellinger Theatre, located in Franke Park near the zoo, seats approximately 2,500, offering seasonal acts and outdoor concerts during warmer months. Located west of downtown, Arena Dinner Theatre is a nonprofit community arts corporation with a focus on live theater production, annually hosting seven full-length theatrical productions. BBQ RibFest spans four-days in mid-June at Headwaters Park, showcasing barbecue rib cooks and vendors and live entertainment. The event attracts around 40,000 visitors annually. BuskerFest held on an evening in late-June at One Summit Square, BuskerFest is a celebration of the busker, or street performer. Performances include fire breathers, street drummers, break dancers, jugglers, mimes, and chalk artists. Fort4Fitness debuted in 2008 to motivate residents in leading healthier lifestyles, the festival includes a certified half marathon, 4-mile (6.4 km) run/walk, health fair, and healthy food expo. Over 9,000 participated in the 2011 half marathon. In 2012, Fort4Fitness debuted its first Spring Cycle, Bike-the-Fort, which included three bicycling tours with over 1,000 participants. Fort Wayne Pride is a two-day event held in late-July at Headwaters Park. Started in 1996, Pride celebrates Northeast Indiana's LGBTQ community, with events such as the Pride March, Fort Wayne's Finest Drag Show, live entertainment, food vendors, and comedy routines. Germanfest first celebrated in 1981, commemorates Fort Wayne's largest ancestral group with such events as the Germanfest Bake Off and National Weiner Dog Finals. German cuisine, dance, and fashion are showcased in this eight-day celebration, held the first week of June at Headwaters Park. Greek Festival spans four-days in late-June at Headwaters Park. Started in 1980, the festival celebrates Fort Wayne's local Greek heritage through food, music, dancing, and 5K run/walk. HolidayFest begins the day before Thanksgiving with the lighting of the PNC Santa and Reindeer light display, Wells Fargo Holiday Display, and Indiana Michigan Power Christmas Wreath, and ending with a fireworks finale at Parkview Field. Other events through the season include the Festival of Gingerbread at The History Center, the Festival of Trees at the Embassy Theatre, the Reindeer Romp 5K, and the Headwaters Park Ice Rink. Japanese Cherry Blossom Festival, a single-day event held in mid-May downtown, celebrates Japanese culture through music, art, and food—specifically Fort Wayne's sister city relationship with Takaoka—and the season in which the cherry blossom trees bloom. Johnny Appleseed Festival is a two-day festival held in the third week of September at Johnny Appleseed Park, where American folklore legend John Chapman is believed to be buried. The event features traditional food, crafts, and historical demonstrations recalling the era of Johnny Appleseed, with an estimated annual attendance of 300,000. National Soccer Festival is staged at IPFW's Hefner Soccer Complex where 20 collegiate soccer programs compete over four days near the end of August. Other activities include youth games, live entertainment, and food vendors. Three Rivers Festival, a celebration of Fort Wayne, spans nine days in mid-July, attracting an estimated 400,000 event-goers. Three Rivers features over 200 events, including a community parade, midway, hot dog eating contest, bed race, raft race, arts fair, and fireworks spectacular. Once Fort Wayne's City Hall, this building now houses The History Center. The African/African American Historical Museum, which opened near downtown in 2000, contains two floors and ten exhibits relating to slavery in the United States, the Underground Railroad, African American inventors, and the history of the local African American community. Established in 1921, the Fort Wayne Museum of Art (FWMoA) is accredited by the American Alliance of Museums, specializing in the collection and exhibition of American art. Just south of the FWMoA, the Auer Center for Arts and Culture was dedicated in 2011 to house local arts and cultural organizations, including Artlink. The Greater Fort Wayne Aviation Museum at Fort Wayne International Airport highlights aviation history in the region and displays memorabilia relating to local aviators, like Art Smith and World War I flying ace Paul Frank Baer. The History Center is located in Fort Wayne's Old City Hall, managing a collection of more than 23,000 artifacts recalling the region's history. The center is overseen by the Allen County–Fort Wayne Historical Society, which also maintains the Richardville House, one of two National Historic Landmarks in the city. Historic Fort Wayne, a replica of the 1815 fortification, is located near the confluence of the three rivers, across the St. Marys River from Headwaters Park. The fort hosts scheduled tours and historical reenactments throughout the year. Located in downtown's Engine House 3, the Fort Wayne Firefighters Museum exhibits artifacts from the Fort Wayne Fire Department dating back to 1839 as well as showcasing four early previously used fire engines. The former City Light and Power Plant just north of downtown Fort Wayne, is home to Science Central, an interactive science center. Science Central contains permanent displays and temporary exhibits which draw about 130,000 visitors annually. Karpeles Manuscript Library Museum, one of ten such museums nationwide, houses a rotating collection of notable documents and artifacts displayed through an educational outreach program. Fort Wayne is currently home to three minor league sports franchises. These include the Fort Wayne Komets of the East Coast Hockey League, Fort Wayne Mad Ants of the NBA Development League, and Fort Wayne TinCaps of baseball's Midwest League. The city is also home to the Fort Wayne Derby Girls of the Women's Flat Track Derby Association Division 2. Intercollegiate sports in the city include IPFW in the NCAA's Division I Summit League as well as NAIA schools Indiana Tech (in the Wolverine–Hoosier Athletic Conference) and University of Saint Francis (in the Crossroads League and Mid-States Football Association). The city was formerly home to three professional sports franchises, including the NBA's Fort Wayne Pistons (now in Detroit), the Fort Wayne Daisies of the All-American Girls Professional Baseball League, and the Fort Wayne Kekiongas of the National Association of Professional Base Ball Players (precursor to the MLB). Some notable events in sports history haven occurred in Fort Wayne. The first professional baseball game was played May 4, 1871 between the Fort Wayne Kekiongas and the Cleveland Forest Citys. It was rained-out in the top of the ninth inning, with the Kekiongas ahead 2–0. On June 2, 1883, Fort Wayne hosted the Quincy Professionals for one of the first lighted baseball games ever recorded. Fort Wayne is also credited as the birthplace of the NBA, as Fort Wayne Pistons coach Carl Bennett brokered the merger of the BAA and the NBL in 1948 from his Alexander Street home. Also, on March 10, 1961, Wilt Chamberlain became the first player in the NBA to reach 3,000 points in a single season while competing at Memorial Coliseum. Fort Wayne was ranked as the "Best Place in the Country for Minor League Sports" in a 2007 issue of Street & Smith's Sports Business Journal, dropping to second place in 2009. John Chapman's grave in Johnny Appleseed Park. The Ron Venderly Family Bridge crosses the St. Joseph River connecting IPFW with the Rivergreenway. Fort Wayne Parks and Recreation maintains 86 public parks and three public golf courses, totaling 2,805 acres (11 km2). Franke Park is the most extensive city park, at 316.4 acres (1.3 km2). Franke is home to the Foellinger Theatre, Shoaff Lake, and the Fort Wayne Children's Zoo, which draws about 500,000 visitors annually. Other notable parks include Johnny Appleseed Park (home to a campground and Johnny Appleseed's grave) and McCulloch Park (home to Samuel Bigger's grave). Foellinger-Freimann Botanical Conservatory, Headwaters Park, Lawton Skatepark, and Historic Fort Wayne are located downtown. Hurshtown Reservoir, near Grabill, is the largest body of water in Allen County and is popular with watersports enthusiasts for sailing and fishing. Located downtown along the St. Marys River, Fort Wayne Outfitters offers canoe, kayak, stand-up paddle board, and pontoon boat rentals for recreation along the three rivers. Starting in the 1970s, the city developed a system of walking and biking trails along the riverbanks, known as the Rivergreenway, with the aim of beautifying the riverfronts and promoting active lifestyles for residents. As of 2013, the Rivergreenway had expanded with additional trails to encompass 70 miles (110 km) throughout the city and county. The Rivergreenway was designated a National Recreation Trail in 2009. With the expansion of trails in recent years, cycling has become an emerging mode of transportation for residents. In 2009, officials announced plans for bicycle lane placement on streets throughout the city and installed more than 250 bike parking places, in accordance with the city's newly adopted comprehensive plan, Bike Fort Wayne. In 2012, the League of American Bicyclists rated the city as Bronze Level for "providing safe accommodation and facilities for bicyclists and encouraging residents to bike for transportation and recreation." The Fort Wayne Trail Network was used by over 480,000 residents in 2012. Fort Wayne has a mayor–council government. The mayor, city clerk, and city council members serve four year terms. Fort Wayne's mayor is Tom Henry, a Democrat, who was elected in 2007. Henry succeeded Democrat Graham Richard who chose not to run for re-election after two terms as mayor. Henry was re-elected for a second term in 2011. Karl Bandemer was appointed deputy mayor in 2013. Sandra Kennedy was elected city clerk in 1983 and has since been re-elected for seven consecutive terms. Fort Wayne City Council has nine elected members, one representative from each of the city's six council districts and three at-large members, serving four-year terms. The members of the city council are: Tom Smith (1st District), Russ Jehl (2nd), Tom Didier (3rd), Mitch Harper (4th), Geoff Paddock (5th), Glynn Hines (6th), Marty Bender (at-large), Dr. John Crawford (at-large), and John Shoaff (at-large). Tom Didier was selected as city council president in 2013. The city is represented in the Indiana General Assembly by three Senate Districts and seven House Districts. Fort Wayne's state senators include Dennis Kruse (14th District), Thomas Wyss (15th), and David Long (16th). Representatives include Dan Leonard (50th District), Ben Smaltz	(52nd), Phil GiaQuinta (80th), Martin Carbaugh (81st), Kathy Heuer (83rd), Bob Morris (84th), and Casey Cox (85th). Federally, Fort Wayne is part of Indiana's 3rd congressional district, represented by Republican Marlin Stutzman, a position he has held since 2010. Under the Unigov provision of Indiana Law, city-county consolidation would have been automatic when Fort Wayne's population exceeded 250,000 and became a first class city in Indiana. Fort Wayne nearly met the state requirements for first class city designation on January 1, 2006 when 12.8 square miles (33 km2) of neighboring Aboite Township (and a small section of Wayne Township) including 25,094 people were annexed. However, a 2004 legislative change raised the population requirements from 250,000 to 600,000, which ensured Indianapolis' status as the only first class city in Indiana. Municipal and state laws are enforced by the Fort Wayne Police Department, an organization of 460 officers. In 2006, Fort Wayne's crime rate was 5104.1 per 100,000 people, slightly above the national average of 4479.3. There were 18 murders, 404 robberies, and 2,128 burglaries in 2006. Garry Hamilton was appointed to the position of police chief in 2014. Also in 2014, Rusty York was appointed to the position of director of public safety. York previously served as police chief from 2000–2014. As of 2010, the Fort Wayne Fire Department includes 375 uniformed firefighters and 18 fire stations. Amy Biggs has served as fire chief since 2012. 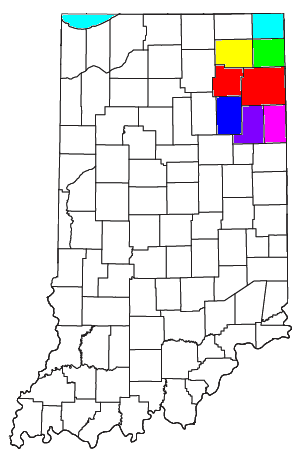 East Allen County Schools (yellow), Fort Wayne Community Schools (pink), Northwest Allen County Schools (blue), and Southwest Allen County Schools (green). Fort Wayne is home to Indiana's fifth largest public university, Indiana University–Purdue University Fort Wayne (IPFW), which has an enrollment of 14,190. IPFW is also home to the Fort Wayne Center for Medical Education, a branch of the Indiana University School of Medicine. The city also holds the main campus of the Northeast Region of Ivy Tech Community College, the second largest public community college campus in Indiana. The city is home to three private universities, including Concordia Theological Seminary, Indiana Institute of Technology, and the University of Saint Francis. Private universities with regional branches located in the city include Crossroads Bible College, Grace College and Theological Seminary, Indiana Wesleyan University, Manchester University College of Pharmacy, and Trine University. Other colleges include Brown Mackie College, Harrison College, International Business College, ITT Technical Institute, MedTech College, National College, and Ross Medical Education Center. Four separate school districts provide public education in the city; East Allen County Schools, Fort Wayne Community Schools, Northwest Allen County Schools, and Southwest Allen County Schools. Fort Wayne Community Schools is the largest public school district in Indiana, enrolling 31,022 students as of the 2011–2012 academic year. Private education is offered largely through Lutheran Schools of Indiana and the Roman Catholic Diocese of Fort Wayne-South Bend. Blackhawk Christian School and Canterbury School also offer private K-12 education. Amish Parochial Schools of Indiana has schools through eighth grade in rural eastern Allen County. The ten-county Northeast Indiana region has the second-highest concentration of New Tech High Schools in the U.S. (behind New York City) and highest concentration in STEM-focused New Techs in the nation. The Allen County Public Library includes 14 branches. Covering 367,000 square feet (34,100 m2), downtown's Main Library Branch contains the Fred J. Reynolds Historical Genealogy Department, the second-largest genealogy collection in North America. The collection is home to more than 350,000 printed volumes and 513,000 items of microfilm and microfiche. The entire library system underwent an $84.1 million overhaul from 2002 to 2007. In 2009, over 7.4 million materials were borrowed by patrons with over 3 million visits made throughout the library system. Broadcast network affiliates include WANE-TV (CBS), WPTA-TV (ABC), WISE-TV (NBC), WFFT-TV (Fox), and WFWA-TV, Northeast Indiana's PBS member station. Religious broadcasters include WINM and W07CL. Two National Public Radio stations are based in the city, WBNI and WBOI. Fort Wayne is served by two primary newspapers, The Journal Gazette and Pulitzer Prize-winning The News-Sentinel. The two dailies have separate editorial departments, but under a joint operating agreement, printing, advertising, and circulation are handled by Fort Wayne Newspapers, Inc. Weekly newspapers include Greater Fort Wayne Business Weekly, whatzup, an alternative newspaper, and Frost Illustrated, an African American newspaper. This F-16C was retired to permanent display at the Fort Wayne Air National Guard Station in 2009. Fort Wayne International Airport is Indiana's third-busiest airport, serving almost 650,000 passengers in 2010. The airport is also home to the 122d Fighter Wing's Fort Wayne Air National Guard Station. Smith Field, in northern Fort Wayne, is used primarily for general aviation. Fort Wayne is served by a single interstate (Interstate 69) along with an auxiliary beltway (Interstate 469). I-69 runs south, terminating at Interstate 465 in Indianapolis and north, terminating at the Canadian border at Port Huron, Michigan. Unlike most cities comparable to its size, Fort Wayne does not have an urban freeway system. In 1946, planners proposed the construction of a $27 million federally funded freeway, crossing east-west and north-south through downtown. Opponents successfully campaigned against the proposal, objecting to the demolition of nearly 1,500 homes at the time of the post-World War II housing shortage, while playing on fears that the project would force displaced minorities into white neighborhoods. In 1947, Fort Wayne residents voted down the referendum that would have allowed for the construction of the freeway, dubbed the Anthony Wayne Parkway. I-69 was constructed around the western and northern suburban areas of the city from 1962 to 1971. The I-469 beltway around the southern and eastern fringes of Fort Wayne and New Haven was constructed between 1988 and 1995 as the largest public works project in Allen County history, at $207 million. Completion of I-469 rerouted most federal and state highways around the city instead of through. Four U.S. Routes intersect the city, including US 24, US 27, US 30, and US 33. Five Indiana State Roads also intersect the city, including State Road 1, State Road 3, State Road 14, State Road 37, and State Road 930. An extension of Airport Expressway was opened in 2001 linking Fort Wayne International Airport directly to I-69 at a cost of $9.8 million. Pennsylvania Railroad Station has stood as a landmark to the city's railroad history since opening in 1914. Amtrak's Broadway Limited (Chicago—Pittsburgh—New York) served the city until 1990 when the line was rerouted north. :24–25 Amtrak's Capitol Limited is the closest passenger rail service, located some 25 miles (40 km) to the north of Fort Wayne in Waterloo. There has been a movement to bring passenger rail service back to the city in the form of Amtrak or high-speed rail service. Freight service is provided by a class I railroad (Norfolk Southern) and two class III railroads (CSX Transportation). Fort Wayne is also the headquarters and main operations hub of Norfolk Southern's Triple Crown Services subsidiary, the nation's largest truckload shipper. Fort Wayne's mass transit system is managed by the Fort Wayne Public Transportation Corporation. Citilink provides 12 bus routes through the cities of Fort Wayne and New Haven via downtown's Central Station. CampusLink debuted in 2009 as a free shuttle service for students, faculty, and general public traveling between Ivy Tech's Coliseum and North campuses, IPFW and its student housing on the Waterfield Campus, and shopping and residential areas. MedLink debuted in 2013 connecting Parkview Regional Medical Center with Parkview Health's Randallia campus. The system's annual ridership is 2.2 million. Fort Wayne is served by two intercity bus providers: Greyhound Lines (Indianapolis—Toledo—Detroit) and Lakefront Lines (Chicago—Columbus—Akron). Fort Wayne is served by six hospitals; Dupont Hospital, Lutheran Hospital of Indiana, Parkview Regional Medical Center, Parkview Hospital Randallia, Rehabilitation Hospital of Fort Wayne, and St. Joseph Hospital, encompassing over 1,463 patient beds. These six hospitals belong to either of the two health networks serving the region: Parkview Health System or Lutheran Health Network. VA Northern Indiana Health Care System's Fort Wayne Campus provides medical services through the Department of Veterans Affairs. Electricity is provided to Fort Wayne residents by Indiana Michigan Power. Northern Indiana Public Service Company provides residents with natural gas. The City of Fort Wayne supplies residents with 72 million US gallons (270,000 m3) of water per day via the Three Rivers Water Filtration Plant and Saint Joseph River. Hurshtown Reservoir, in northeast Allen County, contains 1.8 billion US gallons (6,800,000 m3) of water to be rationed in the event of a drought or disaster at the three rivers. The City of Fort Wayne also provides residents with sewage treatment and offers a full waste collection service. ^ Salter Rodriguez, Rosa (2007-06-22). "'City of Churches' hard to prove: Census stats can't back up old moniker". The Journal Gazette. ^ Lohrmann, Shannon (n.d.). "Flood brought out our best". The News-Sentinel. ^ Olson, Eric (2012-02-29). "30th anniversary of the Great Flood of 1982: Where were you?". Indiana's NewsCenter. http://www.indianasnewscenter.com/news/local/30th-Anniversary-of-the-Great-Flood-of-1982-Where-were-you-140918363.html. Retrieved 2013-07-19. ^ Crothers, Julie (2013-06-18). "Righting a toppled icon". The Journal Gazette. http://www.journalgazette.net/article/20130618/LOCAL/306189979. Retrieved 2013-07-18. ^ "Phelps Dodge Magnet Wire to consolidate operations to Fort Wayne". Inside Indiana Business. 2004-02-16. http://www.insideindianabusiness.com/newsitem.asp?id=10425. Retrieved 2013-07-18. ^ "US Gazetteer files 2010". United States Census Bureau. http://www.census.gov/geo/www/gazetteer/files/Gaz_places_national.txt. Retrieved 2012-12-11. ^ "American FactFinder". United States Census Bureau. http://factfinder2.census.gov/faces/nav/jsf/pages/index.xhtml. Retrieved 2012-12-11. ^ a b "Population Estimates". United States Census Bureau. http://www.census.gov/popest/data/cities/totals/2012/SUB-EST2012.html. Retrieved 2013-06-25. ^ "Fort Wayne, IN to S State Line Rd & State Road 14, Woodburn, 46797 – Google Maps". Google. http://maps.google.com/maps?f=d&source=s_d&saddr=Fort+Wayne,+IN&daddr=S+State+Line+Rd+at+State+Rd+14,+Jackson+Township,+IN&hl=en&geocode=FenRcgIdaeDs-ilLgSL_3eQViDGT90J2FHsHgA%3B&mra=ls&dirflg=w&sll=41.074935,-84.97135&sspn=0.307989,0.615921&ie=UTF8&z=11. Retrieved 2010-08-15. ^ "Fort Wayne, IN to Windy Shore Dr, Coldwater, MI 49036 – Google Maps". Google. http://maps.google.com/maps?f=d&source=s_d&saddr=Fort+Wayne,+IN&daddr=Windy+Shore+Drive,+Coldwater,+MI&hl=en&geocode=FenRcgIdaeDs-ilLgSL_3eQViDGT90J2FHsHgA%3BFeM0fQIdwAzv-inbAMpduysWiDE_dnyVAYMNfg&mra=ls&dirflg=w&sll=41.759532,-84.996243&sspn=0.076702,0.15398&ie=UTF8&ll=41.424194,-85.067139&spn=1.225363,2.463684&z=9. Retrieved 2010-08-15. ^ a b "Metropolitan and Micropolitan Statistical Areas". U.S. Census Bureau. July 1, 2011. https://www.census.gov/popest/data/metro/totals/2011/tables/CBSA-EST2011-01.csv. Retrieved Oct 19, 2013. ^ a b c "Fort Wayne History". City of Fort Wayne. http://www.cityoffortwayne.org/index.php?Itemid=247&id=99&option=com_content&task=view. Retrieved 2008-09-05. ^ a b c d "Workforce & Employment". Greater Fort Wayne Inc.. 2012. http://www.greaterfortwayneinc.com/community-info/annual-labor-force. Retrieved 2013-12-10. ^ a b "Communications & Defense". Fort Wayne–Allen County Economic Development Alliance. 2012. http://www.theallianceonline.com/core-industries/communications-defense. Retrieved 2012-12-29. ^ a b c d e f "Fort Wayne Facts". City of Fort Wayne. http://cityoffortwayne.org/fort-wayne-facts.html. Retrieved 2012-12-30. ^ a b "Sen. Banks Encourages Committee to Review IPFW Independence". www.hoosieraccess.com. http://www.hoosieraccess.com/2012/02/22/sen-banks-encourages-committee-to-review-ipfw-independence. Retrieved 2012-02-23. ^ (March 22, 1845) "Obituaries". The Fort Wayne Sentinel 67 (81). ^ Hackett, Kara (2013-09-24). "Johnny Appleseed Festival full of history". The Journal Gazette. http://www.fortwayne.com/apps/pbcs.dll/article?AID=/20130923/NEWS/320115769/1005/NEWS09. Retrieved 2013-09-24. ^ Lanka, Benjamin (2009-06-20). "City reaches summit: 3rd All-America title". The Journal Gazette. http://fortwayne.com/apps/pbcs.dll/article?AID=/JG/20090620/LOCAL/306209997. Retrieved 2009-06-20. ^ Jarosh, Andrew. "Heroism, tragedy color story of Fort Wayne's worst flood in 1913". The News-Sentinel. http://fwnextweb1.fortwayne.com/ns/projects/history/2000/1910/ind9.php. Retrieved 2012-12-29. ^ Haas Zuber, Connie (2010-11-30). "Lincoln Tower rises above its times". Fort Wayne Monthly. http://fortwaynemonthly.fortwayne.com/?q=article/lincoln-tower-rises-above-its-times. Retrieved 2012-12-29. ^ Leininger, Kevin (1982). "The Fort Wayne flood of 1982". The News-Sentinel. http://www.maykuth.com/stories/recovery904.htm. Retrieved 2013-11-04. ^ Leininger, Kevin (2008-12-16). "Could nonprofit revitalize downtown?". The News-Sentinel. http://newssentinel.com/apps/pbcs.dll/article?AID=/20081216/NEWS/812160333. Retrieved 2009-01-08. ^ Lanka, Benjamin (2009-01-04). "Delays encircle Harrison Square". The Journal Gazette. http://www.journalgazette.net/apps/pbcs.dll/article?AID=/20090104/LOCAL/901040401/1002/LOCAL. Retrieved 2009-01-08. ^ Lanka, Benjamin (2010-09-02). "Courtyard by Marriott opens downtown". The Journal Gazette. http://www.journalgazette.net/article/20100902/LOCAL/309029984. Retrieved 2012-08-08. ^ Lanka, Benjamin (2011-09-30). "$15 million venture set downtown". The Journal Gazette. http://www.journalgazette.net/article/20110930/LOCAL/309309979/1002/LOCAL. Retrieved 2012-08-08. ^ Smith, Ashley (2008-10-01). "Dirt turned on $536M Parkview Regional Medical Center". The News-Sentinel. http://www.news-sentinel.com/apps/pbcs.dll/article?AID=/20081001/NEWS/810010349. Retrieved 2012-12-29. ^ "2010 Census U.S. Gazetteer Files for Places – Indiana". United States Census. http://www.census.gov/geo/www/gazetteer/files/2010_place_list_18.txt. Retrieved 2012-04-21. ^ "Indiana Geography". Indiana University–Purdue University Indianapolis Dept. of Earth Sciences. http://www.iupui.edu/~g135/g135/05_topography/explore02.html. Retrieved 2013-09-12. ^ a b "Assessing and Addressing Indiana Urban Tree Canopy". Indiana Department of Natural Resources. October 2011. http://www.in.gov/dnr/forestry/files/fo-FinalINUTCSummaryRep.pdf. Retrieved 2013-06-14. ^ "Tree Cover % – How Does Your City Measure Up?". Deeproot.com. 2010-04-25. http://www.deeproot.com/blog/blog-entries/tree-cover-how-does-your-city-measure-up. Retrieved 2013-06-14. ^ "Awards & Accomplishments". Fort Wayne Parks and Recreation. http://www.fortwayneparks.org/index.php?option=com_content&view=article&id=65&Itemid=98. Retrieved 2013-06-14. ^ "Fort Wayne, Indiana Climate–Tornadoes". NWS Northern Indiana. http://www.crh.noaa.gov/iwx/CLI/FWA/history/climatedescription.php. Retrieved 2008-04-30. ^ "Saturday marks one year anniversary of June 29 storm". WANE-TV News Channel 15. 2013-06-29. http://www.wane.com/dpp/news/local/saturday-marks-one-year-anniversary-of-june-29-storm. Retrieved 2013-07-02. ^ (2013-01-01). Year in review: Top Fort Wayne news stories. The News-Sentinel. Retrieved on 2013-05-08. ^ "NowData - NOAA Online Weather Data". National Oceanic and Atmospheric Administration. http://www.nws.noaa.gov/climate/xmacis.php?wfo=iwx. Retrieved 2012-02-20. ^ "Climatological Normals of Fort Wayne". Hong Kong Observatory. http://www.hko.gov.hk/wxinfo/climat/world/eng/n_america/us/fort_wayne_e.htm. Retrieved 2011-10-12. ^ "Neighborhood Quadrant Map". City of Fort Wayne. http://www.cityoffortwayne.org/images/stories/mayors_office/docs/quadrants.pdf. Retrieved 2013-07-29. ^ a b c d "Architectural Styles". City of Fort Wayne. http://www.cityoffortwayne.org/architectural-styles.html. Retrieved 2013-07-29. ^ "Williams Woodland Park Historic District". City of Fort Wayne. http://www.cityoffortwayne.org/williams-woodland-park-historic-district.html. Retrieved 2013-07-29. ^ Larson, Cindy (2011-05-14). "Live inside a work of art". The News-Sentinel. http://www.news-sentinel.com/apps/pbcs.dll/article?AID=/20110514/NEWS/105140336. Retrieved 2013-07-29. ^ "Arts United Center". http://www.artsunited.org/the-arts-campus/au-center/. Retrieved 2013-07-29. ^ "One Summit Square". Emporis.com. http://www.emporis.com/building/one-summit-square-fort-wayne-in-usa. Retrieved 2013-07-29. ^ "American FactFinder". U.S. Census Bureau. http://factfinder2.census.gov/faces/nav/jsf/pages/community_facts.xhtml. Retrieved 2012-07-22. ^ Leininger, Kevin (2010-03-13). "Assimilation crucial for Fort Wayne's Burmese". The News-Sentinel. http://fortwayne.com/apps/pbcs.dll/article?AID=/SE/20100313/NEWS/3130344. Retrieved 2010-03-13. ^ "Fort Wayne (city), Indiana". State & County QuickFacts. U.S. Census Bureau. http://quickfacts.census.gov/qfd/states/18/1825000.html. ^ "Indiana - Race and Hispanic Origin for Selected Cities and Other Places: Earliest Census to 1990". U.S. Census Bureau. http://www.census.gov/population/www/documentation/twps0076/twps0076.html. ^ "Religion in Fort Wayne, Indiana". Sperling's Best Places. http://www.bestplaces.net/religion/city/indiana/fort_wayne. Retrieved 2013-11-08. ^ Linsenmayer, Steve (2007-09-24). "Monks here support boycott". The News-Sentinel. http://www.news-sentinel.com/apps/pbcs.dll/article?AID=/20070924/NEWS/709240318. Retrieved 2008-09-24. ^ Bogue, Ellie (2013-09-10). "Burmese Muslims building new mosque in Fort Wayne". The News-Sentinel. http://www.news-sentinel.com/apps/pbcs.dll/article?AID=/20130910/NEWS/130909620/-1/LIVING. Retrieved 2013-09-23. ^ "Falstaff Brewery closing in Ft. Wayne". Chicago Tribune. 1989-11-09. http://articles.chicagotribune.com/1989-11-09/business/8901290492_1_pabst-falstaff-lutz-issleib. Retrieved 2013-12-24. ^ Front Door Fort Wayne. City of Fort Wayne. 2011. pp. 10–11. http://cityoffortwayne.org/images/stories/community_development/planning_and_policy/docs/FrontDoorFW-FINALonline_sm262013.pdf. Retrieved 2013-05-15. ^ "Annual Unemployment Rates". Greater Fort Wayne Inc.. 2012. http://www.greaterfortwayneinc.com/community-info/annual-unemployment-rates. Retrieved 2013-12-10. ^ Wyche, Paul (2013-07-01). "Frontier reorganizes region, with Fort Wayne HQ". The Journal Gazette. http://www.journalgazette.net/article/20130701/BIZ/130709964/1031. Retrieved 2013-08-04. ^ "Leading Employers In Allen County". Greater Fort Wayne Inc.. 2010. http://www.greaterfortwayneinc.com/economic-development/major-employers. Retrieved 2013-12-10. ^ "About Us". The Embassy Theatre. http://www.fwembassytheatre.org/aboutus.htm. Retrieved 2008-05-15. ^ "The History of the Phil". Fort Wayne Philharmonic Orchestra. http://www.fwphil.org/section/history. Retrieved 2013-07-02. ^ "College of Visual and Performing Arts: Facilities – IPFW". Indiana University–Purdue University Fort Wayne. http://www.ipfw.edu/departments/cvpa/about/facilities.html. Retrieved 2013-07-22. ^ "USF Performing Arts Center Full History". University of Saint Francis. http://usfpac.com/history/full-history. Retrieved 2012-12-27. ^ "Fort Wayne Cultural District". Arts United of Greater Fort Wayne. http://www.artsunited.org/our-partners/culturaldistrict/. Retrieved 2012-08-08. ^ "Arts United Center". Arts United of Greater Fort Wayne. http://www.artsunited.org/the-arts-campus/au-center/. Retrieved 2012-08-08. ^ Penhollow, Steve (2011-09-30). "Auer Center opens; Art Lab next phase". The Journal Gazette. http://www.journalgazette.net/article/20110930/LOCAL/309309972. Retrieved 2013-10-16. ^ "Arts United of Greater Fort Wayne - Hall Center". Arts United of Greater Fort Wayne. http://www.artsunited.org/the-arts-campus/hall-center/. Retrieved 2012-08-08. ^ a b "FAME's Impact". The Foundation for Art and Music Education. http://www.famearts.org/fames_impact. Retrieved 2013-07-02. ^ "About Foellinger Theatre". Fort Wayne Parks and Recreation. http://www.fortwayneparks.org/index.php?option=com_content&view=article&id=116&Itemid=181. Retrieved 2012-12-29. ^ "About Us". Arena Dinner Theatre. http://www.arenadinnertheatre.org/pages/AboutUs.html. Retrieved 2013-10-13. ^ "About". BBQ RibFest. http://bbqribfest.com/?page_id=23. Retrieved 2012-08-30. ^ "BuskerFest". Downtown Improvement District. http://downtownfortwayne.com/buskerfest/. Retrieved 2013-07-01. ^ Lanka, Benjamin (2011-09-24). "More than 9,000 participate in Fort4Fitness". The Journal Gazette. http://fortwayne.com/apps/pbcs.dll/article?AID=/20110924/NEWS09/320105658. Retrieved 2011-11-09. ^ "Inaugural F4F Spring Cycle a huge success!". Fort4Fitness, Inc.. http://www.fort4fitness.org/files//120526_F4F_PR_2012_SpringCycle_Recap.pdf. Retrieved 2010-08-10. ^ "History". Germanfest. http://www.germanfest.org/pages/history.html. Retrieved 2010-08-10. ^ Swanson, Andrew (2008-11-27). "Lights wow crowds". The News-Sentinel. http://www.news-sentinel.com/apps/pbcs.dll/article?AID=/SE/20081127/NEWS/811270333&SearchID=73342066716380. Retrieved 2010-08-10. ^ "Culture & Entertainment". JapanInFortWayne.com. http://www.japaninfortwayne.com/culture/cherry_blossom.html. Retrieved 2013-07-01. ^ Todd, Deb (2009-09-16). "Fall's favorite festival: Johnny Appleseed weekend has been an area fixture for 35 years". The News-Sentinel. http://www.news-sentinel.com/apps/pbcs.dll/article?AID=/20090916/NEWS01/909160305/1001/NEWS. Retrieved 2012-08-30. ^ "Soccerpalooza". ShinDigz National Soccer Festival, Inc.. http://fwsoccerpalooza.com/index.php?page=college. Retrieved 2010-08-10. ^ Organ, Aaron (2010-07-22). "TRF chief happy with this year's numbers". The News-Sentinel. http://www.news-sentinel.com/apps/pbcs.dll/article?AID=/20100722/NEWS/7220357. Retrieved 2010-08-10. ^ "History of the Museum". African/African–American Historical Museum. http://www.myblackinfo.com/african_americanfw_history.htm. Retrieved 2010-08-10. ^ "About the Museum". Fort Wayne Museum of Art. http://www.fwmoa.org/About. Retrieved 2013-09-24. ^ "Aviation Museum". Fort Wayne–Allen County Airport Authority. http://www.fwairport.com/air-museum.aspx. Retrieved 2010-08-10. ^ "Collections". Allen County–Fort Wayne Historical Society. http://www.fwhistorycenter.com/collections.html. Retrieved 2010-08-10. ^ "Home". Historic Fort Wayne, Inc.. http://www.oldfortwayne.org/index.php. Retrieved 2013-09-24. ^ "Home". Fort Wayne Firefighters Museum. http://www.fortwaynefiremuseum.com. Retrieved 2010-08-10. ^ "Fact Sheet 2012". Science Central. http://sciencecentral.org/about-us/fact-sheet. Retrieved 2013-06-18. ^ a b c d (2008-01-19). Fort Wayne Sports Moments. The News-Sentinel. Retrieved on 2009-06-11. ^ Sebring, Blake (2013-05-17). "Carl Bennett built part of Fort Wayne history". The News-Sentinel. http://fortwayne.com/apps/pbcs.dll/article?AID=/20130517/SPORTS/320126915. Retrieved 2013-05-17. ^ Rushin, Steve, (2007-02-05). Storming The Fort (wayne). Sports Illustrated. Retrieved on 2008-05-16. ^ King, Bill (2007-08-20). "Fort Wayne's #1". Street & Smith's Sports Business. http://www.sportsbusinessjournal.com/article/55963. Retrieved 2008-05-16. ^ Sebring, Blake (2009-08-24). "Fort Wayne's named No. 2 minor-league sports city". The News-Sentinel. http://www.news-sentinel.com/apps/pbcs.dll/article?AID=/20090824/NEWS02/908240336/1001. Retrieved 2009-08-28. ^ "Fort Wayne Children's Zoo to hold job fair March 9". The News-Sentinel. 2013-02-26. http://www.news-sentinel.com/apps/pbcs.dll/article?AID=/20130226/LIVING/130229632. Retrieved 2013-03-14. ^ Todd, Deb (2013-05-29). "Take a hike (or bike ride) Saturday on National Trails Day". The News-Sentinel. http://www.fortwayne.com/apps/pbcs.dll/article?AID=/20130529/LIVING/320125954. Retrieved 2013-05-29. ^ a b Goldsborough, Jaclyn (2013-05-15). "Cycling in Fort Wayne: Fort Wayne Trails brings together community with Trek the Trails". The News-Sentinel. http://www.fortwayne.com/apps/pbcs.dll/article?AID=/20130515/NEWS/320127065/1005/NEWS09. Retrieved 2013-05-15. ^ "Verbatim: Rivergreenway earns national designation". The Journal Gazette. 2009-05-28. http://www.journalgazette.net/article/20090528/BLOGS01/905289908. Retrieved 2009-06-09. ^ Wiehe, Jeff (2009-03-22). "Mayor unveils plans for 3 bicycle lanes". The Journal Gazette. http://www.journalgazette.net/article/20090322/LOCAL/303229879/1002/LOCAL. Retrieved 2009-03-22. ^ "Pedal plan, paths win prestigious award". City of Fort Wayne. http://www.cityoffortwayne.org/latest-news/2212-pedal-plan-paths-win-prestigious-award-.html. Retrieved 2013-03-14. ^ (2013) "Getting around". Fort Wayne Monthly's City Guide 2013. ^ a b "City Council". City of Fort Wayne. http://www.cityoffortwayne.org/city-council.html. Retrieved 2010-06-26. ^ ""Four more years:" Henry wins re-election bid in mayor's race". Indiana's NewsCenter. http://www.indianasnewscenter.com/home/Democrats-Celebrate-Henry-Win-133500393.html. Retrieved 2013-10-08. ^ Leininger, Kevin (2013-10-08). "Henry taps Karl Bandemer as Fort Wayne's new deputy mayor". The News-Sentinel. http://www.news-sentinel.com/apps/pbcs.dll/article?AID=/20131008/NEWS/131009646. Retrieved 2013-10-08. ^ "Office of the City Clerk". City of Fort Wayne. http://www.cityoffortwayne.org/office-of-the-city-clerk.html. Retrieved 2010-06-26. ^ "Thomas F. Didier – 3rd District". City of Fort Wayne. http://www.cityoffortwayne.org/thomas-f-didier-3rd-district.html. Retrieved 2013-10-08. ^ "Indiana Code 36-3-1". State of Indiana. http://www.in.gov/legislative/ic/code/title36/ar3/ch1.html. Retrieved 2007-03-31. ^ "Senate Bill No. 225". State of Indiana. http://www.in.gov/legislative/bills/2004/SB/SB0225.1.htm. Retrieved 2007-03-31. ^ "About the Fort Wayne Police Department". Fort Wayne Police Department. http://www.fwpd.org/about.html. Retrieved 2010-06-26. ^ a b "Fort Wayne IN Crime Statistics (2006 Crime Data)". AreaConnect Fort Wayne. http://fortwayne.areaconnect.com/crime1.htm. Retrieved 2010-06-26. ^ Bogue, Ellie (2014-01-02). "New Fort Wayne police chief and director of public safey sworn in". The News-Sentinel. http://www.fortwayne.com/apps/pbcs.dll/article?AID=/20140102/NEWS/320149826/1005/NEWS09. ^ "Fort Wayne Fire Department Annual Report 2010". Fort Wayne Fire Department. http://fortwaynefiredepartment.org/images/Miscellaneous/Stacey/Annual_Report_2010.pdf. Retrieved 2013-05-15. ^ Lanka, Benjamin (2012-06-14). "Woman is named city's new fire chief: Peers know her as skilled, personable". The Journal Gazette. ^ Haynie, Devon (2011-09-20). "FWCS likely stays No. 2". The Journal Gazette. http://fortwayne.com/apps/pbcs.dll/article?AID=/20110920/NEWS09/320106105/0/SEARCH. Retrieved 2012-08-08. ^ "Advantages". Northeast Indiana Regional Partnership. http://www.neindiana.com/why-northeast-indiana/advantages. Retrieved 2013-06-17. ^ West, Nick (2009-10-09). "Genealogy gathering; 420 expected for conference, library's largest yet". The News-Sentinel. http://www.news-sentinel.com/apps/pbcs.dll/article?AID=/20091002/NEWS/910020346. Retrieved 2010-08-09. ^ "The Genealogy Center". Allen County Public Library. http://www.genealogycenter.org/pdf/AboutUsBrochure.pdf. Retrieved 2012-12-27. ^ Checca, Carey (2001-11-27). "Library petition counts due today". The Journal Gazette. ^ "2009 Annual Report". Allen County Public Library. http://www.acpl.lib.in.us/aboutus/ar/ACPLAnnualReport2009.pdf. Retrieved 2010-08-09. ^ "Transportation and Airports". Fort Wayne-Allen County Economic Development Alliance. http://www.theallianceonline.com/transportation.aspx. Retrieved 2009-06-29. ^ "Home of the Blacksnakes". 122nd Fighter Wing. http://www.122fw.ang.af.mil/history/index.asp. Retrieved 2010-06-27. ^ "Airport History". Smith Field Airport. http://smdairport.com/airport-history.aspx. Retrieved 2012-12-27. ^ Leininger, Kevin (2011-12-03). "Fort Wayne: Fat, stupid... and melancholy?". The News-Sentinel. http://www.news-sentinel.com/apps/pbcs.dll/article?AID=/20111203/NEWS/111209914. Retrieved 2013-02-05. ^ a b Lanka, Benjamin (2008-07-20). "Bypassing the bypass". The Journal Gazette. http://www.journalgazette.net/apps/pbcs.dll/article?AID=/20080720/LOCAL/807200426/1002. Retrieved 2012-08-08. ^ "Commissioners OK extra money for road extension". The Journal Gazette. 2000-07-07. ^ Caylor, Bob (2009-04-04). "Rally for Fort Wayne train service draws hundreds". The News-Sentinel. http://www.news-sentinel.com/apps/pbcs.dll/article?AID=/20090404/NEWS/904040330/0/FRONTPAGE. Retrieved 2009-11-22. ^ a b "Rail System". Greater Fort Wayne, Inc.. http://www.greaterfortwayneinc.com/community-info/rail-system. Retrieved 2013-12-08. ^ "Citilink service routes map". Fort Wayne Public Transportation Corporation. http://www.fwcitilink.com/pdfs/route.map.routes.pdf. Retrieved 2009-02-06. ^ a b Leininger, Kevin (2009-04-25). "Free bus service to link 2 campuses to dorms, city". The News-Sentinel. http://fortwayne.com/apps/pbcs.dll/article?AID=/SE/20090425/NEWS/904250317. Retrieved 2009-04-25. ^ Sade, Vivian (2012-12-15). "Parkview subsidy helps transit system add Medlink". The Journal Gazette. http://www.journalgazette.net/article/20121215/LOCAL/312159983/-1/LOCAL11. Retrieved 2013-12-03. ^ "Lakefront Lines Scheduled Intercity Bus Service". http://webstore.lakefrontlines.com/schedules.asp. Retrieved 2013-07-29. ^ "Fort Wayne Campus". U.S. Department of Veterans Affairs. http://www.northernindiana.va.gov/visitors/Fort_Wayne_Indiana.asp. Retrieved 2013-07-25. ^ a b c "Utilities". Fort Wayne–Allen County Economic Development Alliance. http://www.theallianceonline.com/data/uploads/Community%20Profiles/Community_Profile%20SQ.pdf. Retrieved 2010-06-27. ^ "Three Rivers Filtration Plant". City of Fort Wayne. http://www.cityoffortwayne.org/utilities/images/stories/docs/FiltrationPlant.pdf. Retrieved 2012-12-27. ^ "Hurshtown Reservoir". City of Fort Wayne. http://www.cityoffortwayne.org/utilities/images/stories/docs/HurshtownReservoir.pdf. Retrieved 2012-12-27. ^ "About FWSCI". Fort Wayne Sister Cities International, Inc.. http://www.fortwaynesistercities.org/about_fwsci.php. Retrieved 2013-07-29. This page uses content from the English language Wikipedia. The original content was at Fort Wayne, Indiana. The list of authors can be seen in the page history. As with this Familypedia wiki, the content of Wikipedia is available under the Creative Commons License.